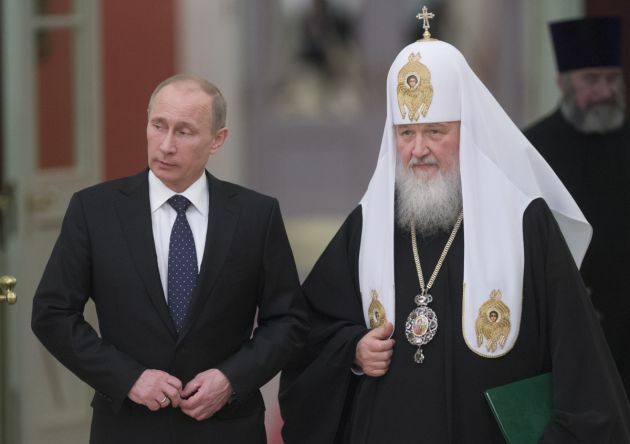 (Photo: REUTERS / Sergei Gunyeev / Ria Novosti / Kremlin)Russia's President Vladimir Putin (L) and Patriarch of Moscow and All Russia Kirill arrive for the meeting with Russian Orthodox church bishops in Moscow February 1, 2013. As troops loyal to Russian President Vladimir Putin were seizing control of Crimea in March 2014, the head of the Russian Orthodox Church in Moscow deduced that an "internal political crisis" in Ukraine was threatening its territorial integrity. Russian officials who seized control of Crimea from Ukraine are placing new restrictions on churches and Islamic institutions there, a Scandinavian news service in freedom of religion and belief reports. Since March, when Russian annexed Crimea places of worship and individuals of some faiths (including followers of Islam, Jehovah's Witnesses and the Orthodox Christian Kiev Patriarchate) have faced violent attacks, Forum 18 reports. It said, however, attacks on Muslim and Kiev Patriarchate places of worship also took place before 2014, also without the perpetrators being identified and punished. Russia regards the Crimean peninsula as an integral part of Russia, since it took over control. Ukraine and the international community, however, do not recognize the peninsula as part of Russia. The peninsula is now divided between two Russian federal regions, the Republic of Crimea (with its capital in Simferopol) and the port city of Sevastopol. The Kiev Patriarchate, an Orthodox church, states that five of its 10 priests in the region have been forced to leave Crimea amid threats, and that it has lost at least two of its churches. The government's Crimean Property Fund is also massively increasing the Patriarchate's rent for a building it uses as its cathedral in Simferopo, said the news agency. The Kiev Patriarchate - which emerged in the early 1990s - is the second largest Orthodox Church in Ukraine after churches under the Moscow Patriarchate. The Kiev Patriarchate is not recognized as canonical by any other canonical Orthodox Church. At the same time all 1,546 religious communities in the peninsula which had State registration with the Ukrainian authorities will be required to re-register under Russian law if they wish to retain legal status. Priests of the Ukrainian Catholic Church who are not natives of Crimea will be allowed to minister for only three months at a time before leaving for a month and re-applying for admission. Catholics in Sebastopol, who had hoped for the return of their cathedral (which had been confiscated under Soviet rule), now doubt the building will be returned. And the Ukrainian Orthodox Church-Kiev patriarchate, which challenges the dominance of Orthodox body loyal to Moscow, has found that the "rent" for its cathedral in Simferopol, the capital city of Crimea, has been dramatically raised. Crimean officials, however, deny that a decree which will lead to a substantial rise in the rent the Kiev Patriarchate Ukrainian Orthodox Church pays on its nearly 20-year-old cathedral in the Crimean capital Simferopol is a targeted move. "There is no discrimination in relation to this particular church," Lyudmila Khorozova of Crimea's Property Fund, which owns the building, told Forum 18. She was unable to explain why no decrees have been adopted relating to other religious communities.